By: Benjamin Graham was the most influential investor of all time. His work laid the foundation of modern security analysis. About The Book Benjamin Graham inspired people everywhere in the world and is known to be the most famous investment advisor of the 20th century. 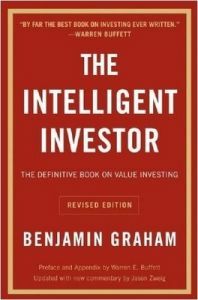 His book The Intelligent Investor is recognized and believed to be the stock market bible since it was published in 1949 because of Graham's philosophy called Value Investing which explains to investors how to develop long term strategies and prevent errors. Famous investor, Warren Buffett, has described this book as the best book on investing ever written. The Intelligent Investor teaches us how to reach our goals financially and how to avoid the calculated risks involved. This book has become famous as being imperative for everyone in the business of investing. Our market has come a long way and the advancements are a proof of Graham's take on finance, his plans and ideas. Jason Zweig, a financial journalist infuses his outlook about how the market functions in today's world with Graham's examples and the current financial order and plans. This is what you can expect in the current revised edition of the book, while still safeguarding Graham's unique text. All this is done to make applying Graham's principles easier in day to day life. This book is available in paperback. Key Features The many examples are used to give us more clarity on the finance world. The idea of retaining the original plan of Graham and infusing it with the current day to day financial situations makes this book a big success. About the author: Benjamin Graham was the most influential investor of all time. His work laid the foundation of modern security analysis. About the Author: Benjamin Graham was born on May 8th, 1894 and died on September 21st, 1976. He was known as the father of Value Investing. Graham was an American and was born in Britain. His love for finance kept burning bright, as he taught at the Columbian Business School. His keen interest in finance is what has made our present day investments fruitful.